It’s a local beer festival, for local people! We like a good beer festival in the Czech Republic! But then, why wouldn’t we? With so many outstanding beers and small, independent breweries, we don’t have to restrict ourselves to one big Oktoberfest… for the connoisseur, every day can be a beer festival, especially at around 1 Euro for half a litre! 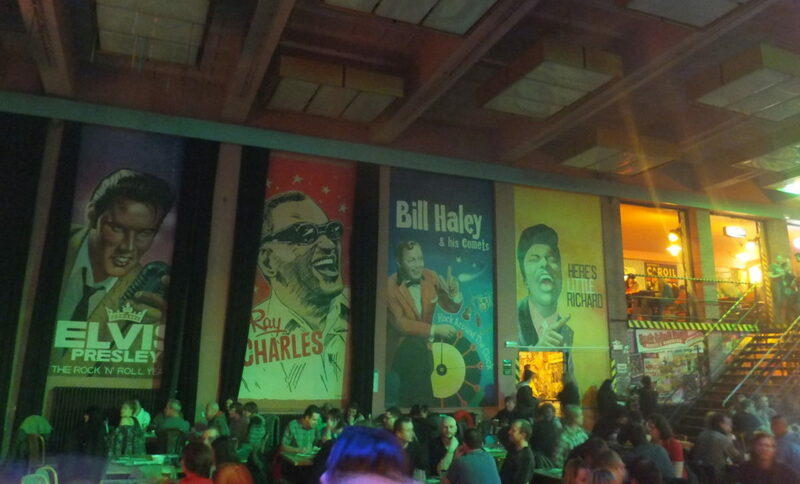 The Rock and Roll Garage, Music Club and Restaurant, is the sort of place that makes this country great. It’s an old tram garage at the end of the line in Martinov, now done out in the finest Jack Rabbit Slim’s style, with dining tables in the backs of vintage cars, retro artwork on the walls and a general ambiance suggesting Marlon Brando might come crashing through the doors on a motorbike at any moment to have a few beers with James Dean after a heavy afternoon’s rebelling. All the stars are out tonight. 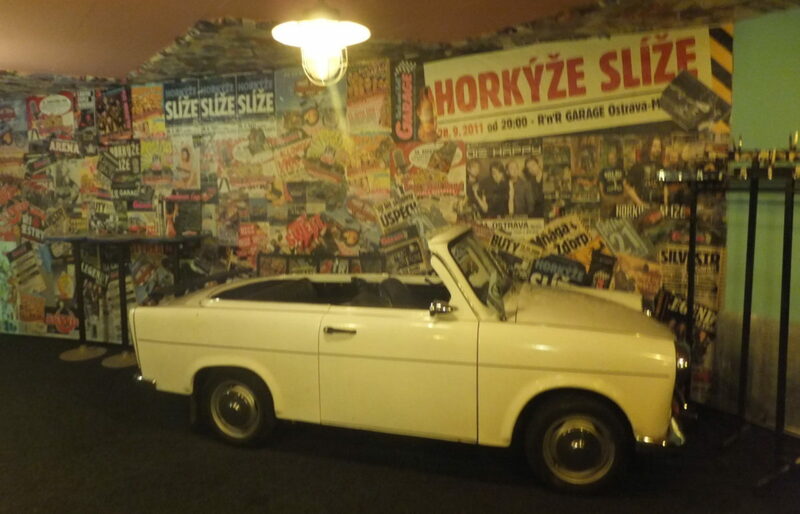 Czech Rock and Roll history! In this den of mock-Fifties factiousness I discovered that there is a lot more to producing beer than I would ever have suspected from misguided youthful experiments with cheap home-brew kits. Strutting up to the bar like John Travolta and Uma Thurman, Our Lass and I decided to start with the beers produced right here in Garage’s own brewery. A choice of Světlý (light), Polotmavý (half-dark) and Tmavý (dark) were advertised by a nonchalantly racist sign above the taps. I started with a half-dark beer to prove my multicultural credentials. Homemade beer from the finest ingredients, unfiltered, unpasteurised. 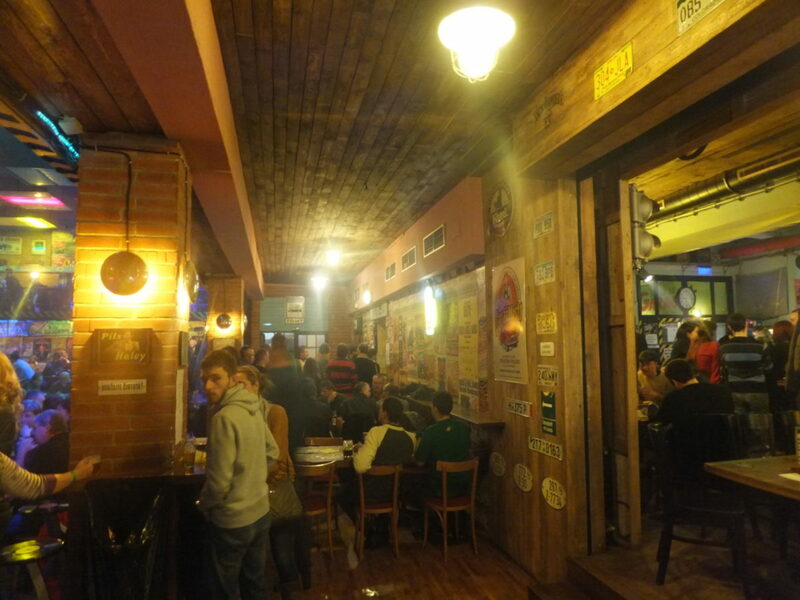 Czech beers are measured in degrees, rather than alcohol by volume (ABV) which baffles all visitors and nearly all Czechs are completely unable to explain them. In fact, the degrees are from the Plato scale, sometimes known as Original Gravity. Happily for those of us who love a fine beer, Degrees Plato (°P) is a direct measurement of the amount of fermentable material in the wort. Thus a higher number of degrees, whilst also indicating a higher alcohol content, is more accurately pointing out that more natural goodness went into producing that alcohol and so you have a beer with more body and soul. There is no simple way to convert °P into ABV but dividing it by 2.5 is a good rule of thumb. Typical beers in most pubs are 10° (around 4% ABV) or 12° (4.8-ish % ABV). 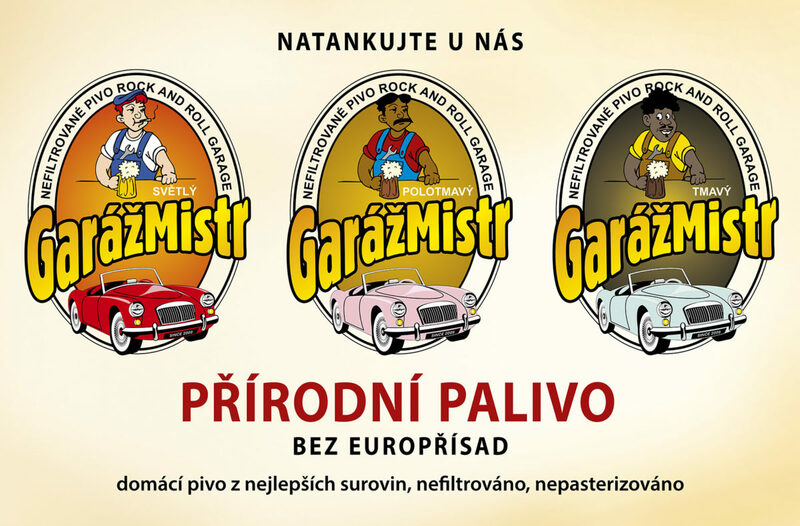 My silky smooth Garáž Polotmavý was a nice compromise at 11°(4.4 or so % ABV). Amusingly altered road signs point to the Ladies’ and Gents’ toilets. Next up was a Horní Lomna Tmavé. Also 11°, its caramelised sugar really comes to the fore during drinking and fades without leaving any sweet stickiness. This is essential if you are to avoid continually going to the bathroom to rinse your mouth out between beers! Coming over from the Dark Side for a moment, I sampled Garáž Světlý. In the jaded way of one used to the fine things in life, I didn’t think that much of it. In a land of outstanding quality beers, this one was merely excellent. It was reminiscent of a Natural Blonde from Dark Star, if I recall it correctly. If not, it was totally different. It does have a very alluring after-taste, though. A sneaky Polotmavé Rymařov (13°, about 5.2% ABV) while Our Lass was dancing soon brought me back to my senses. In the way of Czech beers, it is bitter, but light. The heaviness in traditional British bitter beer is what put me off it so much although I will admit that a pint of warm, foaming beer on a freezing cold winter’s night is preferable to a pint of cold, foaming beer on a freezing cold winter’s night. This little beauty, however, was a light, refreshing lager. Soft on the belly and fading to a warm glow which delights the whole palette. During this cultural extravaganza, Our Lass and I had met some friends. Our Lass was off dancing with His Lass and He and I were grinning at each other in the manner of men who would like to talk to each other but can’t because of the noise. A band was on the stage pounding out all the Czech favourites with the unstoppable force of a runaway freight train on a downhill grade. 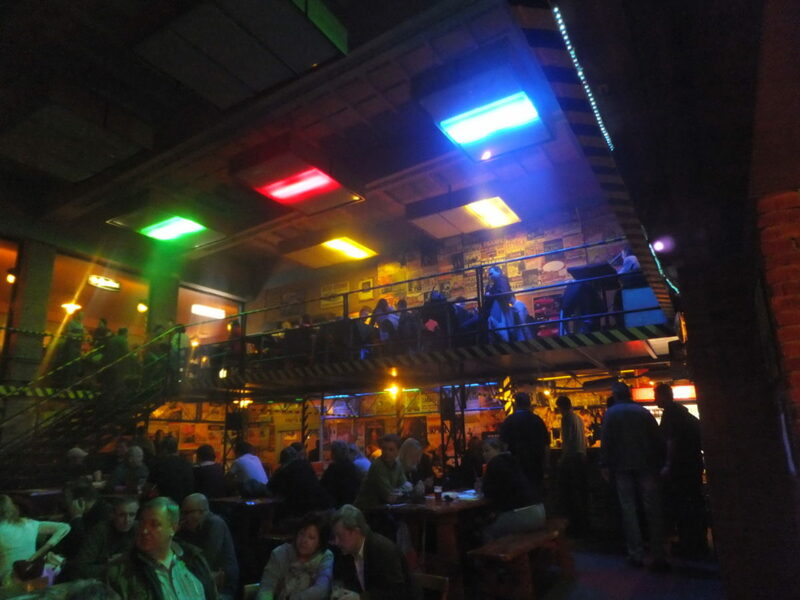 This had polarised the audience; women were dancing, men were sitting at the tables drinking. Well, it was a beer festival, not a disco! Are you here to dance, or drink? In lieu of conversation, I wandered over to the nearest bar. If there’s one thing that this bar isn’t short of, it’s bars! Unfortunately, all the men who weren’t at tables drinking seemed to be in front of me in the queue. Through the mass of heads, I could only see the word ‘Špek’ (pork scratchings) on the board, but it seemed like a good idea. Any time you plan on drinking with Czechs, a big plate of fatty pork by-products is useful as it helps to line the stomach. Many Czech men’s stomachs are so well-lined that they have what is known as ‘A Czech Profile’, meaning that they’re lardy fat-boys. So, what fine beer should I have with my pork scratchings? As I drew nigh to the bar, I saw more of the blackboard, specifically I saw more information about the pork scratchings… Qasek Schpek Tmavé 12° (4.8% ABV). That’s right folks, PORK SCRATCHING FLAVOURED BEER! Well, I had to try this, I mean, what‘s the point of coming to a beer festival if you don’t try anything new? If nothing else, you don’t often get the chance to ask a barman for a pint of fried pig skin and there’s probably a good reason for that! It arrived in a small glass, as if it was embarrassed by its own audacity but it was actually a flavour rainbow. It had a sweetish initial taste, quickly followed by full, dry bitter flavours and mellowing to nostalgic tones of, let’s be honest, Frazzles. Despite this throwback to 1980s school lunchboxes, the meaty tang soon faded to the refreshing after-taste we know and love so much from Czech beers. How is this even drinkable, let alone refreshing? Well, that’s a secret known only to a few select initiates but if these beers were likely to turn up in small glasses, I had to choose bars with shorter queues! 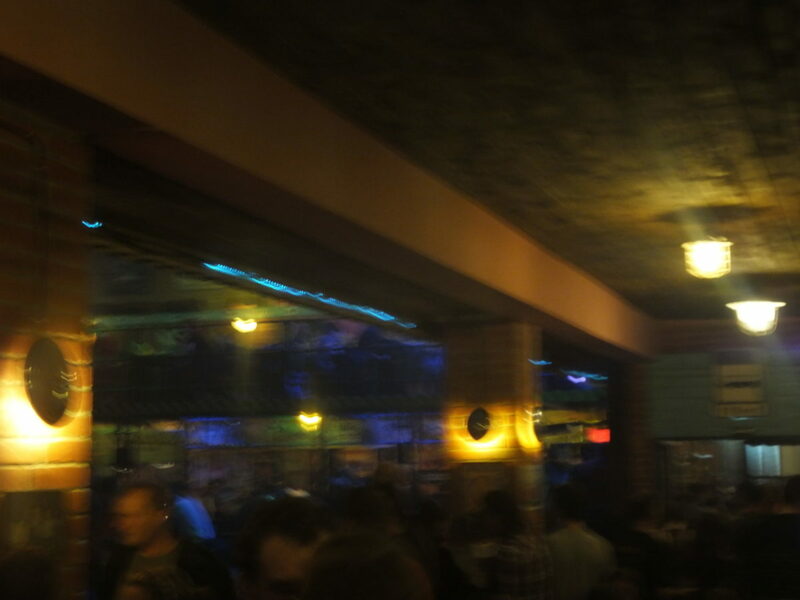 As the evening progressed, the Men Who Don’t Dance, still sat at their tables, had started to sing along to the band and wave their tankards in the air, liberally redistributing their beers among the crowds. One or two tables were largely empty, save for a modest lake of spilled beer, a scattering of crisp packets and a decorative drunk passed out face down in the muck. Blessed is he who, in the name of charity and good will, shepherds the weak through this festival of fine beers. For he is truly his brother’s keeper and the finder of lost children. The band had really ramped things up a notch, which I found amazing considering their collective age was about double that of the Rolling Stones. Some of the slumbering drunks were reinventing themselves as air-drummers and guitarists and were giving the real band a run for their money in terms of entertainment value. A shorter queue led me to a delightful little honey (the beer, not the barmaid). Again, from the Qasek stable, Med (Honey) is a respectable 11° or (% ABV). At first taste, it had the light, fruity air of a young wine. This quickly developed into a refreshingly cool and mellow bouquet reminiscent of a pale ale with prickly undertones, before finally winding up in the neighbourhood of a light bitter, with a sheepish look on its face and no idea how it got there. Hot on the heels (literally) of the Med, I discovered Fire-Dog. If Med is a heavenly angel among beers, gently massaging your taste buds, then Fire-Dog is a Hell’s Angel wielding a bike chain and looking for a fight. Another beer which came in a small glass, Fire-Dog is definitely not embarrassed by its own audacity. At 11° (4.4% ABV), its most notable feature is that it’s made from blisteringly hot chillies and not much else. In my opinion it needed the Scoville scale, not the Plato scale! A deceptively soft and smooth feel amuses the palate and lulls you into a false sense of security, whilst its delightfully elusive spicy undertones distract the tongue from an unexpected broadside of raw heat. As you reel back from this onslaught, you are assaulted by waves of maddened fire-ants rampaging down your throat and so distracted that you walk slap-bang into the final pyroclastic surge and hardly notice that your eyes are streaming and your nose has begun to discharge itself with no thought for public decency. If this beer were to become widely available in the UK, I would predict the demise of the late-night curry house full of Fosters-swilling drunks. Why drink that filth if you can simply order a pint of beer-flavoured vindaloo and have done with it? About this time, I noticed the sound guy. It HAD to be the sound guy! I’d seen him throughout the whole evening, never speaking to anyone. He was skinny with waist-length gray hair, black jeans, a smiley-face headband (also gray and black) and regulation-issue Sound Engineers’ Union faded black Led Zeppelin T-shirt. The real giveaway was how he stood in various strategic locations, craning his head like a Meerkat, making furtive gestures to an accomplice hidden in the shadows and occasionally frowning as if a favoured guest had soiled the bed. Oops, time to go home! I vaguely remember ordering another beer after this but history doesn’t record which one. I remember being surprised that it was only 26 CZK, further surprised that it came in yet another small glass (with a distinctly insouciant attitude, I felt) and positively shocked to discover that it cost a lot more than 26 CZK. Patiently, the barman explained that it wasn’t 26 CZK but 26°, or to put it bluntly, over 10% ABV. It was malty and sugary, according to my notes. Possibly also ‘sickly’, although it could have been ‘sticky’. Hard to tell with the remnants of a hot-dog smeared across the page. Nonetheless, I felt that the evening had shown me all it could. Our Lass and I had done some serious research into the shady world of the micro brewery beer festival and come off rather well, all things considered. The band had begun singing ‘international’ hits (American, mostly), but very obviously didn’t speak English. I noticed it in the first verse of ‘Nah-nah-nah-nah-nah-nah-nah-nah-earth and wood, nah-nah-nah-nah-nah-nah-nah-nah-Johnny B. Goode’, which wasn’t too bad, I suppose. Neither was ‘Wild Thing, nah-nah-nah-naaaah sing’, but when they started on ‘Daaaaaaaah, dah, Miss American Pie, dah-dah Chevy dah-dah-Levy, dah-dah-Levy-dah-dah’, we decided to make good our escape. It’s surprising how a bunch of really good musicians can sound like a drunken Sunday night pub karaoke team, simply by not singing in their own language! As we boarded the tram, my system was still mulling over the Fire-Dog. It wasn’t so much an after-taste as an after-burn. My mouth was filled with the curious feeling that a vicious little pixie with a tiny Gatling gun was peppering my tongue with red-hot needles. 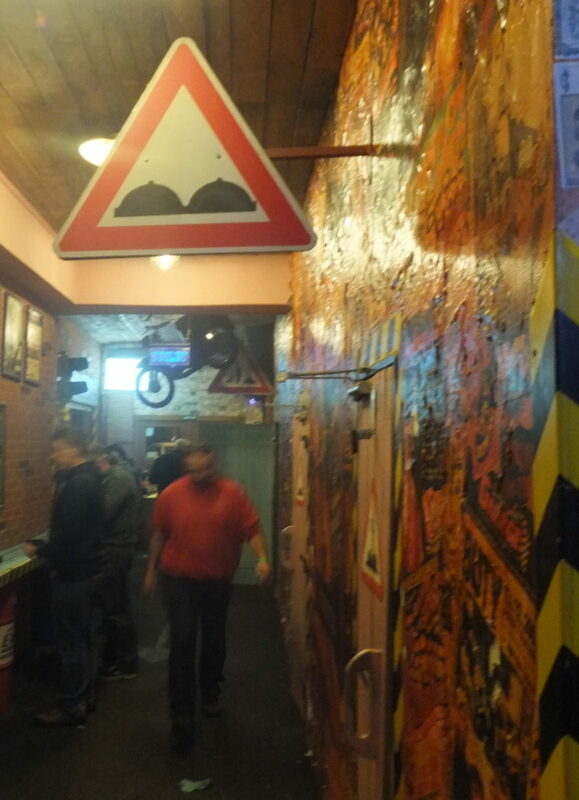 Curiously different, I thought, but then so much about life in the Czech Republic is. WHY NOT CONTACT US FOR MORE INFORMATION ON WHERE TO STAY AND WHAT TO SEE WHEN YOU VISIT THE CZECH REPUBLIC? HAVE A HOLIDAY WITH A DIFFERENCE!